LAS VEGAS (June 23, 2016) – The LINQ Promenade will be the most patriotic destination in Las Vegas this Fourth of July weekend. With four days of celebrations planned beginning Friday, July 1, and continuing through Monday, July 4, there will be myriad ways to celebrate Independence Day. A lively and colorful Fourth of July parade for the entire family starts at the Las Vegas Boulevard end of The LINQ Promenade and continues to the Fountain Stage on Friday, Saturday, Sunday and Monday at 2 p.m. Then, from 2-5 p.m., guests will enjoy the spectacle of more family-friendly live atmospheric entertainment—think stilt walkers, caricature artists and face painters—all sure to delight little ones and their grownup companions alike. Meanwhile, DJ Miguel—the high-energy interactive performing DJ—will spin his signature “Rockin’ Hip Poppin’ Motivating Music” from 2:30 to 4:30 p.m. Friday through Sunday. ameriCAN – Red, Light & Brews, $1 off featured Coors Light and Blue Moon beers on draft, or pay $30 and enjoy an open bar featuring the same brews. Also, now through July 5, “Pour One Forward” for members of the military—patrons can pay to give a beer to our nation’s heroes. Finally, on July 4, join ameriCAN’s Grand Opening Celebration from 7 to 9 p.m., followed by an open bar for $17.76 beginning at 9 p.m.
Amorino – Gelato cart and seasonal gelato offerings made with their world-famous, authentic Italian recipe. Chayo Mexican Kitchen + Tequila Bar – Beer and food cart featuring $5 featured canned beers, $3 street corn and $3 tacos. Flour & Barley Brick - Oven Pizza – The All-American Pizza, topped with barbecue sauce, cheddar cheese, hamburger meat, hot dogs and French fries for $17.50. Haute Doggery – Grilled hot dog topped with decadent barbecued pork, creamy cole slaw and barbecue sauce, garnished with crispy firecracker onions for $7.50. Jimmy Buffett’s Margaritaville – Fireworks viewing party on July 3 from 8 to 10 p.m. for $125 per person, including an open call-brand bar, heavy appetizers, guaranteed seating on the third floor patio with a view of Caesars Palace’s fireworks show. Off The Strip Bistro & Bar – Gourmet sausages with accoutrements accompanied by craft beers from local and domestic breweries. Sprinkles Cupcakes – Lemon Meringue Ice Cream, lemon curd ice cream loaded with graham cracker crumbles and marshmallow cream; Lemon Blueberry Cupcakes. Starbucks – Freshly brewed iced tea and lemonade. Tilted Kilt Pub & Eatery – Red (Killian’s Red), Light (Coors Light) and Blue (Blue Moon) beer. Virgil’s Real Barbecue – Complimentary samples of this restaurant’s famous spicy popcorn; Virgil’s is scheduled to open at The LINQ Promenade in October. 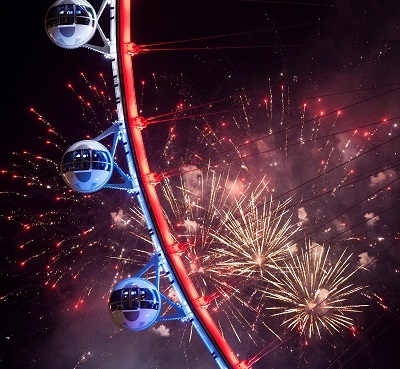 Revelers seeking a magnificent vantage point for fireworks should purchase tickets for the High Roller observation wheel. It’s the perfect spot to view the Caesars Palace fireworks display on Sunday, July 3, at 9 p.m. With its 360-degree views of the entire valley, guests on the High Roller can also enjoy breathtaking sights of the various firework displays all weekend long. Locals’ tickets are always 50 percent off and free for children 12 and under. Plus, all guests who ride the High Roller on Sunday, July 3, will receive a festive and collectible Fourth of July commemorative t-shirt (while supplies last). For more information about Fourth of July activities at The LINQ Promenade, please visit TheLINQ.com. The LINQ Promenade, an open-air shopping, dining and entertainment district, anchored by the world’s tallest observation wheel, the High Roller, has redefined the iconic Las Vegas skyline and is the recipient of the very first “Las Vegas Icon Award” by the Clark County Commissioners. Located at the heart of the world-famous Las Vegas Strip, The LINQ Promenade features more than 30 unique retail, dining and entertainment venues and plays host to a variety of special events, festivals and more. Topping out at 550 feet, the High Roller observation wheel, voted “Best Attraction of 2015,” “Best Amusement Ride of 2015” and “Best Place to View the City of 2015” by the readers and editors of the Las Vegas Review-Journal, is the focal point of the unique urban entertainment district. The wheel’s 28 glass-enclosed cabins feature an interactive experience including video and music that fade away to unveil spectacular views of the famed resort city in the 30 minutes it takes to complete one full revolution. Each cabin accommodates up to 40 people. Cabins are available for individual or group experiences. For more information, visit TheLINQ.com.